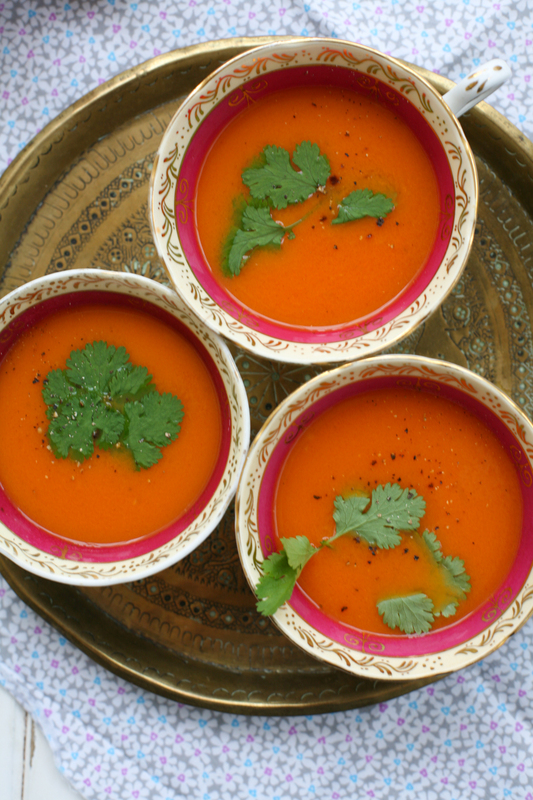 There is nothing more sublime than a spicy hot tomato soup to warm you up and give you that inner glow. If you are feeling under the weather with a cold or fever, which invariably many of us do at this time of year, this is a great way to blast your system with goodness and help pull you through. 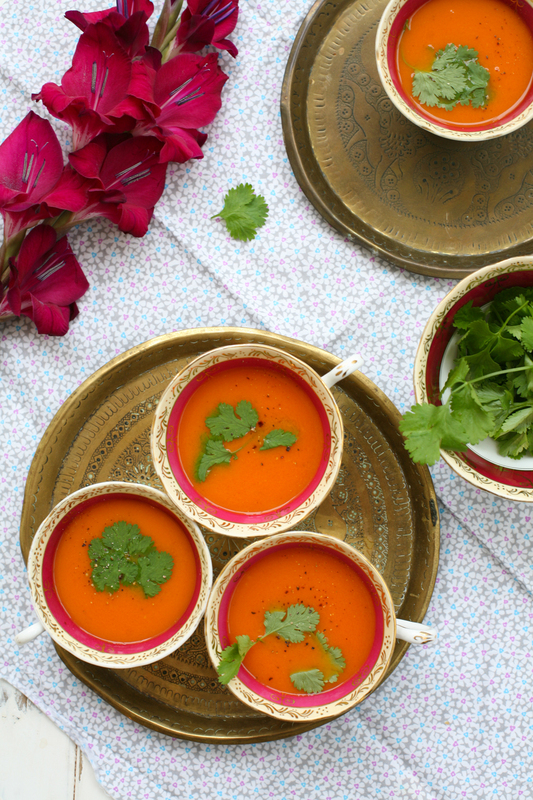 Rasam, as it is known in South India, translates to ‘juice’ or in Sanskrit rasa means ‘taste’. I think ‘tasty juice’ is the perfect way to describe this warming, fragrant and flavoursome soup. Traditionally it is made with tomatoes or tamarind with a host of spices and fresh curry leaves giving it a comforting aroma and taste. Being totally addicted to tomatoes I tend to make my rasam with tomatoes as the base note. 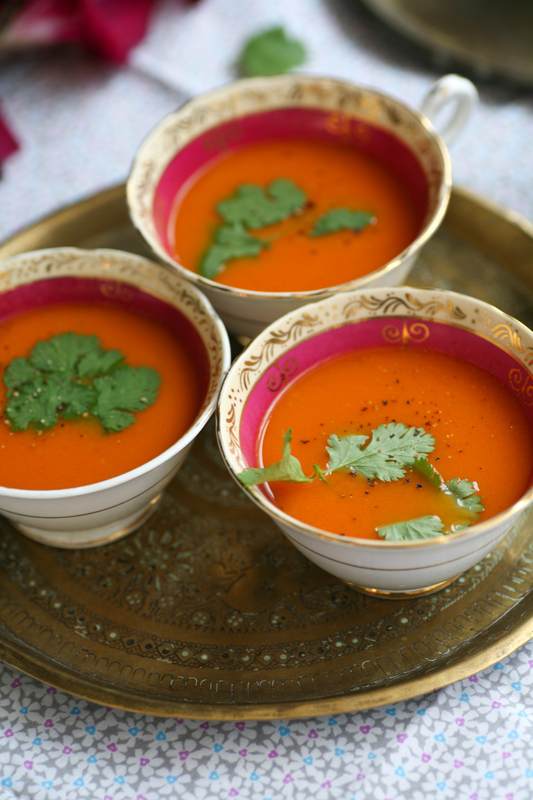 Traditionally it is eaten in India at the end of a meal, but I tend to serve it the opposite way round and kick a meal off with a warming cup of this thin spiced tomato soup to whet the taste buds. It is often served in a mug or cup or can be poured over a bowl of hot steaming basmati rice. It’s also the perfect drink after a long, cold and invariably wet winter walk. With a roaring fire going and a cup of rasam you will feel a state of happiness surround you. Seriously try it and you’ll know what I mean. The only tricky (ish) ingredient to source is fresh curry leaves. If you go to your local Asian grocer they are likely to have some, or at least will be able to point you in the right direction. So what are you waiting for – give it a go and leave and comment below to let me know how you get on. 1. Warm the oil in a deep non-stick pan and when it is hot add the garlic, ginger, dried red chillies, fresh curry leaves and crushed black pepper and gently move around the pan so that the chillies darken and the ginger and garlic begin to bronze. Keep on a medium heat for a few minutes before adding the tomatoes, salt and sugar. 2. Move around the pan so that the tomatoes begin to soften and are completely covered in all of the ingredients. Then add the water and let it boil for a couple of minutes before lowering the heat and cover for 30 mins. 3. Using a hand blender blend the soup so that it is smooth and then pass through a sieve so that there are no pips or tomato skin and what remains is brilliant red, smooth thin rasam. 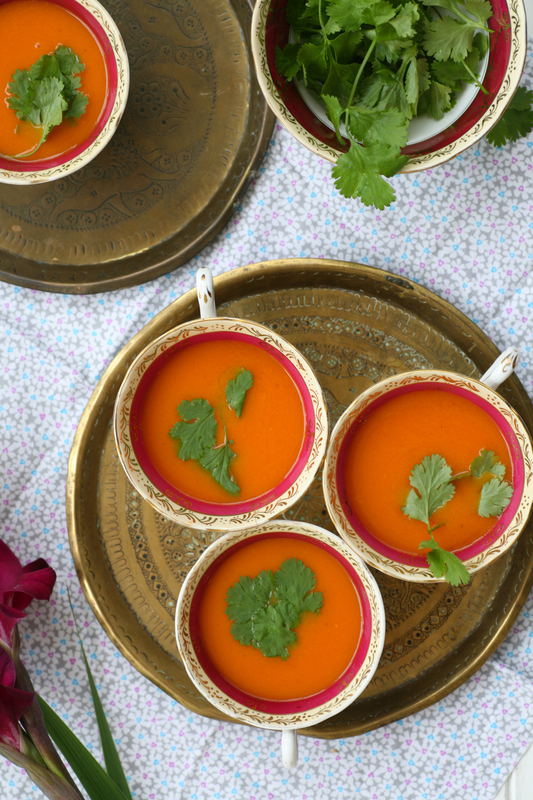 Heat up the smooth rasam gently in the pan before serving. 4. Pour into cups and garnish with some fresh coriander and black pepper. This entry was posted in Soup, Vegetable, Vegetarian and tagged curry leaves, india, Indian, rasam, soup, spice, tomatoes, winter. Bookmark the permalink. I love tomato soup but have never made an Indian spiced version before. Definitely a recipe I need to recreate – love all the flavours going on in it. Me too. This version is wonderfully tasty with a lovely satisfying aroma. If you can get hold of fresh curry leaves it takes it to a new level of deliciousness. Enjoy and thanks for commenting. Just what I need for the cold cold rainy weather we are having! Looks wonderfully inviting too! You’ll love it (I hope). I find it warming and very tasty – hope you agree. Thanks for commenting. So which did you make? Love the look of the Moroccan one too. Delicious.